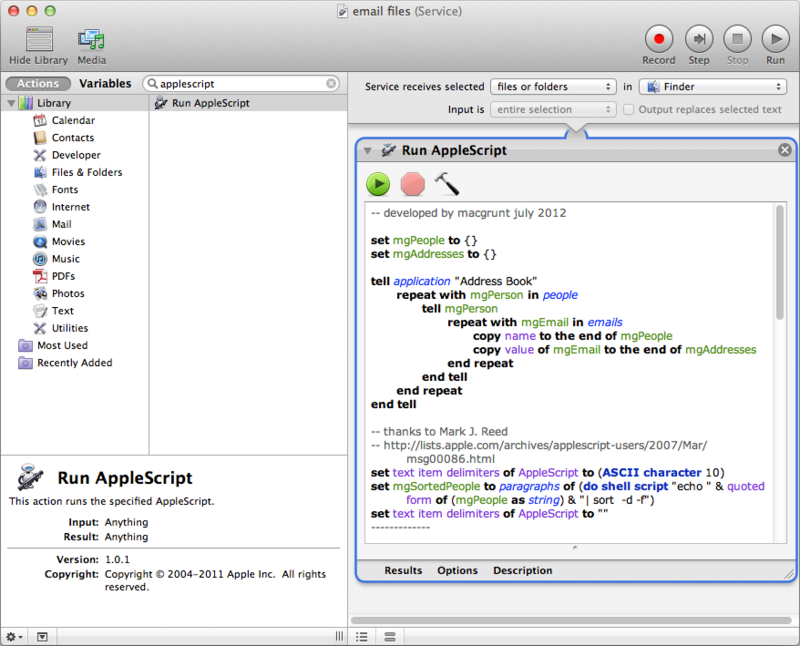 the applescript outlined in email file from finder II takes selected items in the finder and attaches them to a new outgoing email message. it allows for multiple recipients from your address book and automatically adds a subject line and some basic content to the email. there are a few ways to make that applescript accessible in the finder but the most convenient is to turn it into a service. this method is for OS X 10.6 and later — you can see a similar procedure for earlier operating systems in the post get file path of finder items. 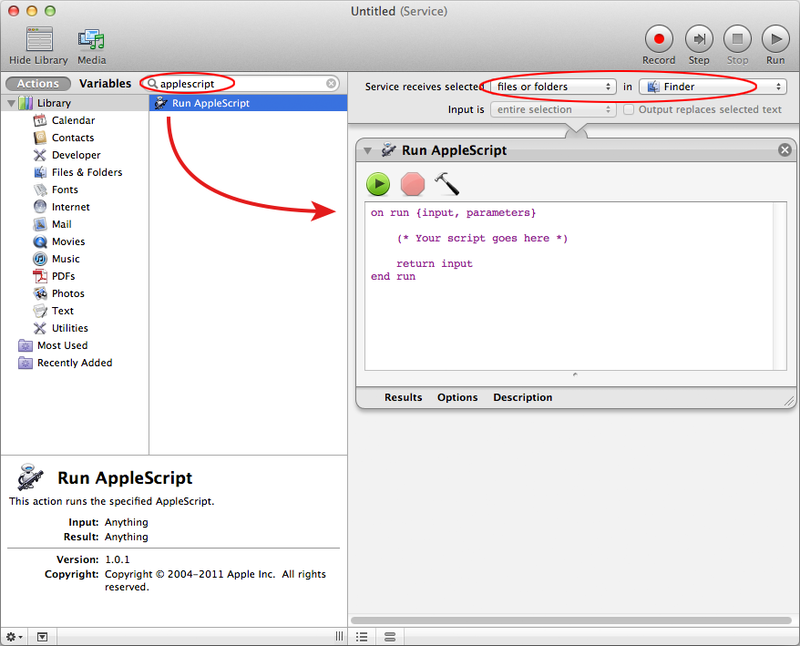 applescript services can be created through automator — the automation program that comes standard on every mac since OS X 10.4 (you’ll find it in your applications folder). of course, services aren’t just restricted to running your applescripts. investigate the full power of automator … and get grunting. here’s a handy trick based on an original post you can find here at Macworld. 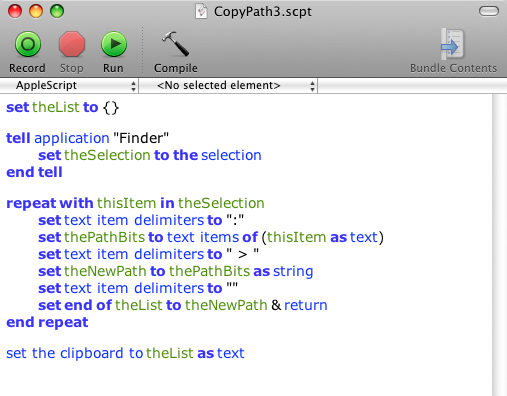 this shows that ‘Script Editor’ can be found in the folder ‘Applescript’ which is in the folder ‘Applications’ — a slash delimited filepath. you can download CopyPath as a finished script here. having to launch an app every time you want to copy a filepath would be a right pain. but you can turn this script into a contextual menu item with automator. here’s how. 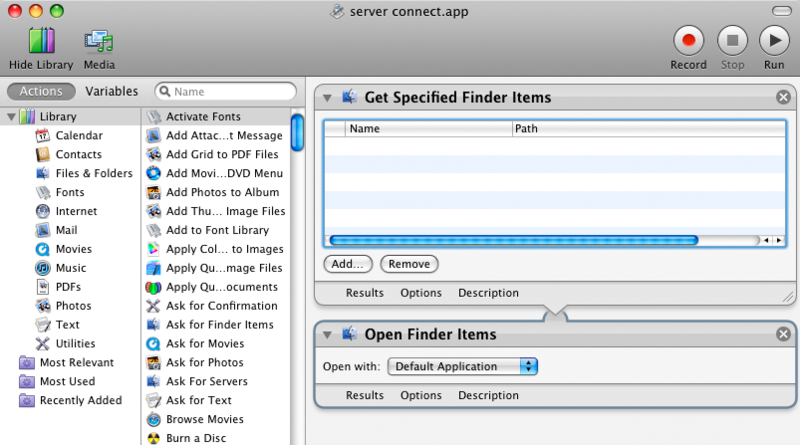 set the service to allow input from files and folders in the finder. you guys are so advanced, you’re sure to work it out yourselves. 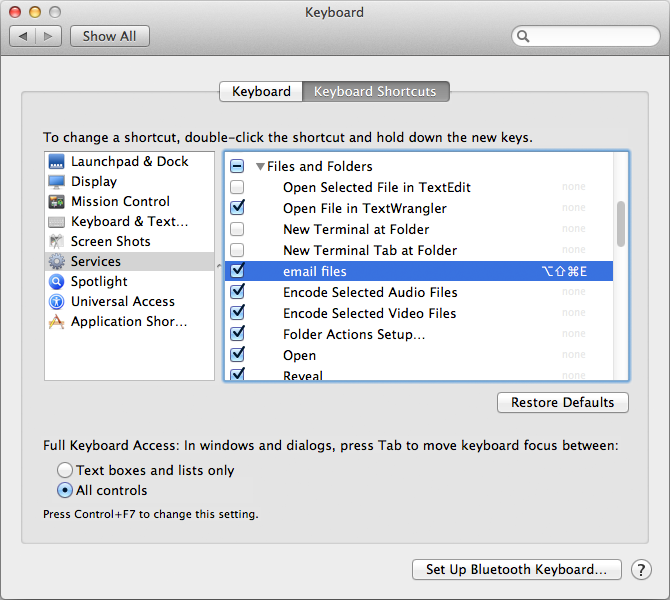 you’re bound to find many other uses for this handy feature of automator. sometimes you need to rename a whole bunch of files. sometimes you find you’re doing the same kind of renaming time and time again. sometimes this gets exceedingly tedious. 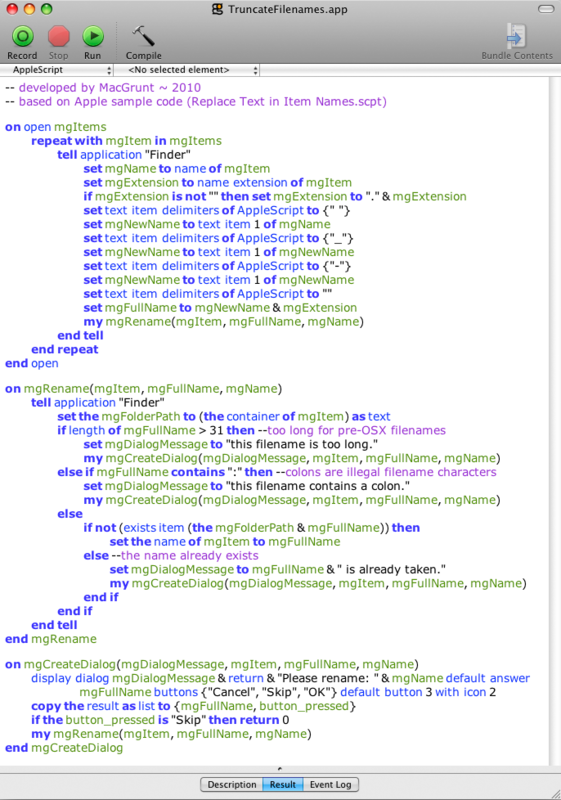 automator and applescript are perfect for this kind of monkey-work. 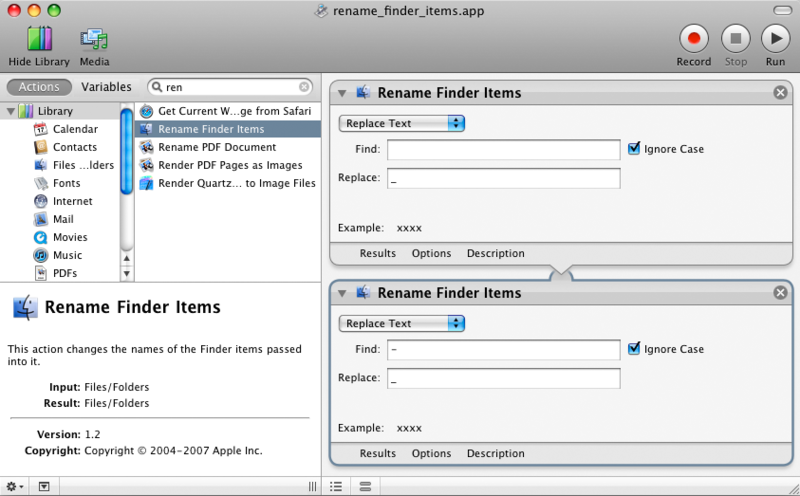 in automator, investigate the various options in the rename finder items action. you can add dates and times, renumber files sequentially, change case, all sorts of stuff. the action window also shows you an example of what the final filename will look like — this is a big help when looking at all the different date/time options. the example below shows how to replace all spaces and hyphens in filenames with underscores (click to enlarge the screen grab). the first ‘find’ field has a space typed in it. after you set it up, save the workflow as an application and drag it onto your sidebar for easy access. unlike the mounting servers example, this workflow doesn’t need a get specified finder items action — because it works as a droplet instead, which means you just drag-and-drop files onto the app and they’ll be renamed in less time than it takes to say “wow, that’s fast!”. The screen grabs below show filenames before and after conversion (click to enlarge). but some renaming tasks are too complex for automator and that’s when you need applescript. for example, this script truncates filenames by stripping out everything after and including the first space, hyphen or underscore. perfect for renaming product images for a webshop (and a million other household purposes). download and drag it to your sidebar — it works as a droplet. 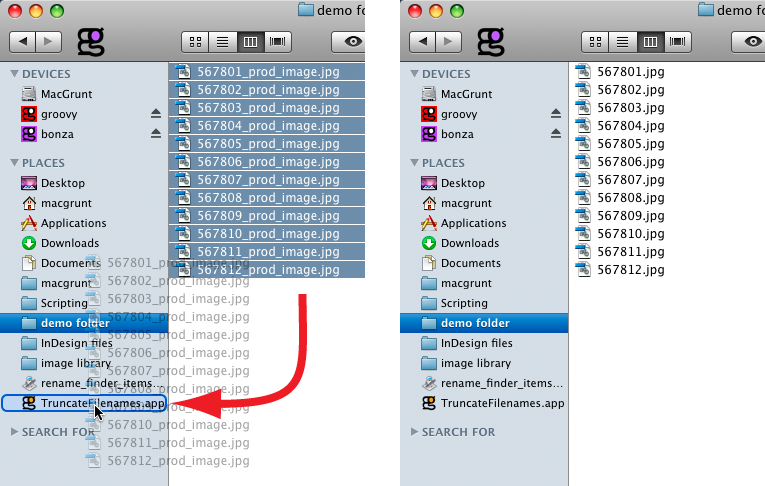 The screen grabs below show filenames before and after conversion (click to enlarge). caution: this script works exactly as described, but make sure you’re happy with how the script renames your files before running it on a big batch — you can’t ‘undo’ file renaming in the finder (unless you have a time machine). when an applescript is saved as a droplet, its icon includes a downwards pointing arrow. the on open mgItems line at the start of this script is what allows the saved application to run as a droplet. without that on open command you’d need to find some other way to reference the files to be changed. set mgItems to selection of application "Finder"
but surely you’d have to agree that saving it as a droplet is probably the best solution in this case (?). • related post : renaming finder items II : renaming by list. 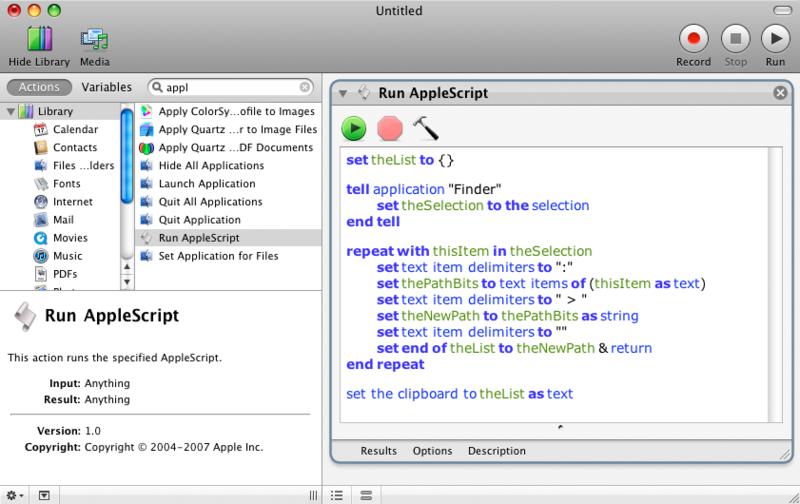 applescript is a great way to automate repetitive and tedious tasks. you can find an applescript solution for connecting to smb (or afp) servers here. however, if connecting to servers is the only thing you want the workflow to do, it’s just as easy, if not easier, to use automator. here’s one way. 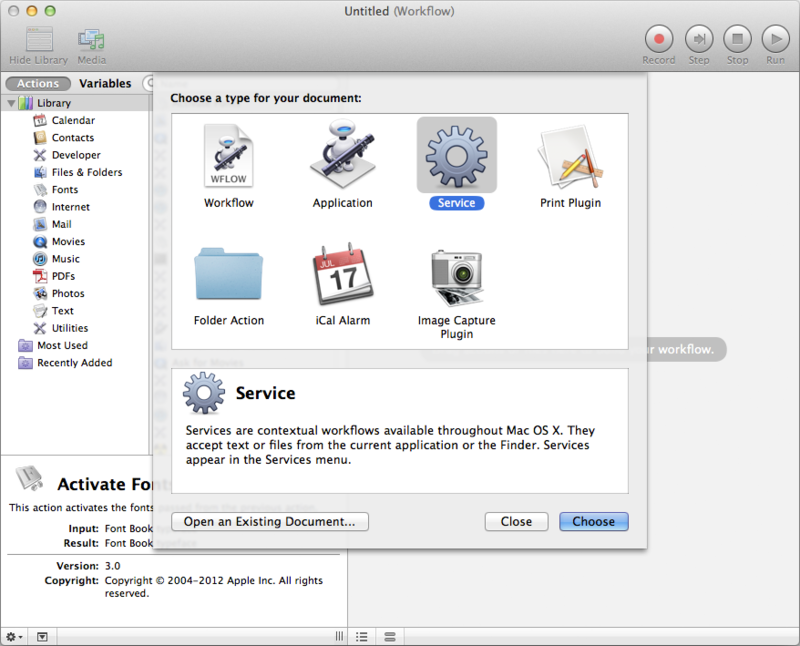 first open the automator application and drag these two actions into the workspace : get specified finder items and open finder items (it’s easy to find an automator action by typing just a few letters into the search field). next, create aliases of your servers in an appropriate place (you can usually do this by simply dragging the volume into a folder — you may need to hold down command-option as you click and drag). 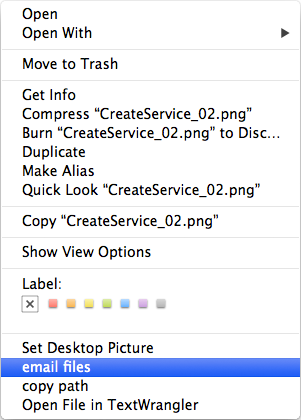 then drag the aliases into the get specified finder items window in your automator workflow. save it as an application and you’re done. then you just need to decide where you’re going to launch it from. the dock is handy for this one. if you prefer to automatically mount the servers at startup, you can add the app to your login items (system preferences > accounts > login items — click the ‘+’ button and navigate to where you saved the app). NOTE: if you are going to launch at startup, you may need to add a pause to the beginning of the workflow to allow other services to finish starting up first. if your mac tries to connect to the servers too soon, you’ll get an error.